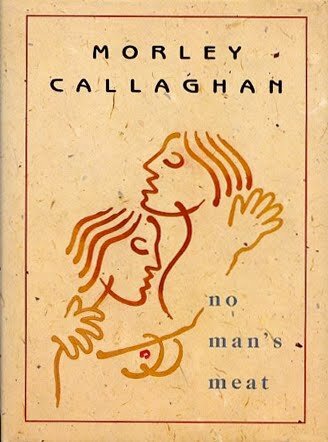 Bought nearly a quarter century ago, it turns out that this, not No Man's Meat, was the first signed and numbered edition in my collection. That General Ludd was overlooked is understandable, I think; there's no real indication that this book is in any way unusual. What we have here is John Metcalf's signature, with a number in the upper right hand corner. This latter feature caused considerable confusion when it was purchased. No, not the price, but the number: 45 of 100 copies. Or was it 50 copies? As I say, nearly a quarter century ago. I'd heard the word used by the late Harry Hill, actor and raconteur, in one of his scabrous anecdotes involving a power failure in the lavatory of the Montreal Voyageur Bus terminal at Berri-de Montigny and the loss of his partial plate. The binding of this General Ludd is by The Porcupine's Quill. I'm a great fan of the press – it has produced some of the finest and finest looking small press books this country has seen – but this design seems deathly dull; quite the opposite of the novel itself. That confusion at the cash took place in the Double Hook. Also gone. Not the limited edition, mind you, but the paperback. It's a new, unread book that is typical of used books and just might have some notes or highlighting. Oh, it might also be an ex-library book. Still, you'll be surprised. Just remember, it's a new, unread, used book. This can be yours for only US$102.76 (shipping included!). 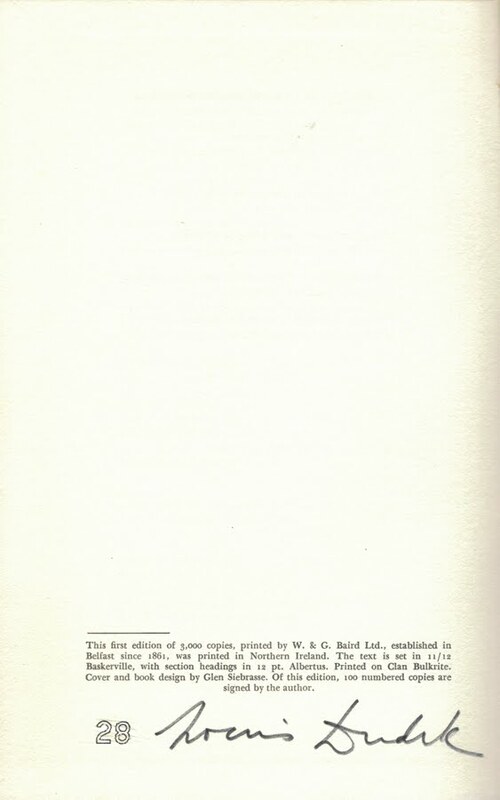 "This first edition of 3,000 copies, printed by W. & G. Baird Ltd., established in Belfast since 1861, was printed in Northern Ireland. The test is set in 11/12 Baskerville, with section headings in 12 pt. Albertus. Printed on Clan Bulkrite. Cover and book design by Glen Siebrasse. 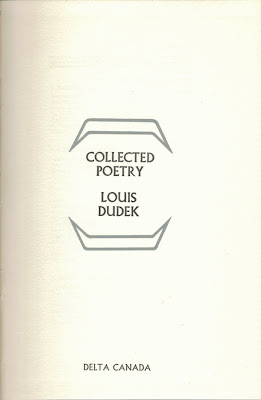 Of this edition, 100 numbered copies are signed by the author." The most attractive of all Delta Canada's books, I think, though this image hardly does it justice. My photographical limitations aside, the problem is that embossed title on the front cover. No ink, just glossy white paper. Commercial suicide? Not necessarily – consider the original pressings of The White Album. Delta Canada co-founder Michael Gnarowski tells me that Dudek was less than keen, likening the shiny white book to a refrigerator. Siebrasse, on the other hand, was justifiably proud of the design. 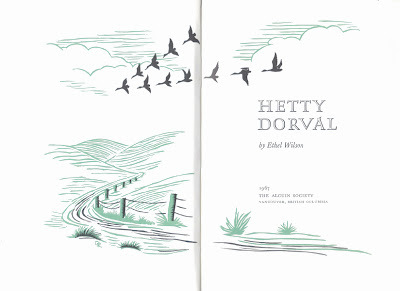 The title design used on the jacket and boards is more easily made out on the title page. 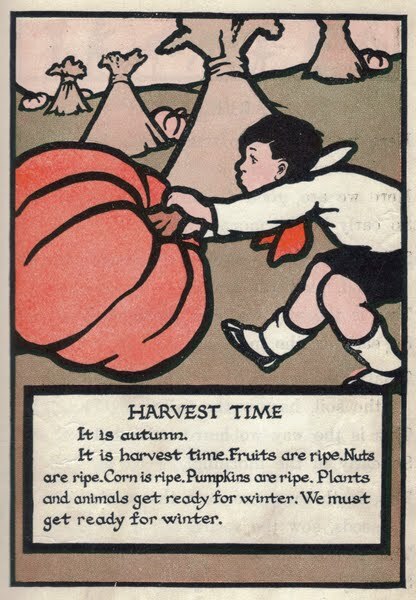 Three thousand printed – seems such a high number in today's sorry market. You'll find only fifteen copies listed for sale online, none of which are numbered and signed. I bought mine for $75 back in 1994. 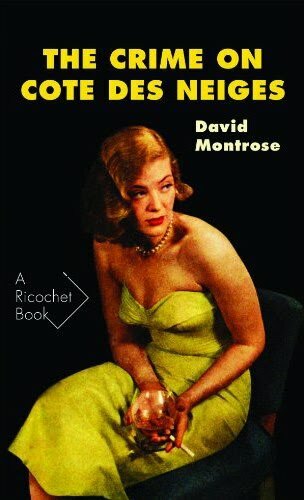 ... and arriving in bookstores: The Crime on Cote De Neiges by David Montrose. First published by Collins White Circle in 1951, it wasn't the first Montreal pulp noir (that would be Ted Allan's 1949 Love is a Long Shot) or the most famous (Brian Moore's Wreath for a Redhead), but it is better than both novels. The first book in the new Véhicule Press Ricochet Books series, I was honoured to have been asked to write the Foreword. Back then – August – you couldn't buy a copy of this 59-year-old pulp. A few have since turned up. All from the same Winnipeg vendor, they go for US$33 to US$59. 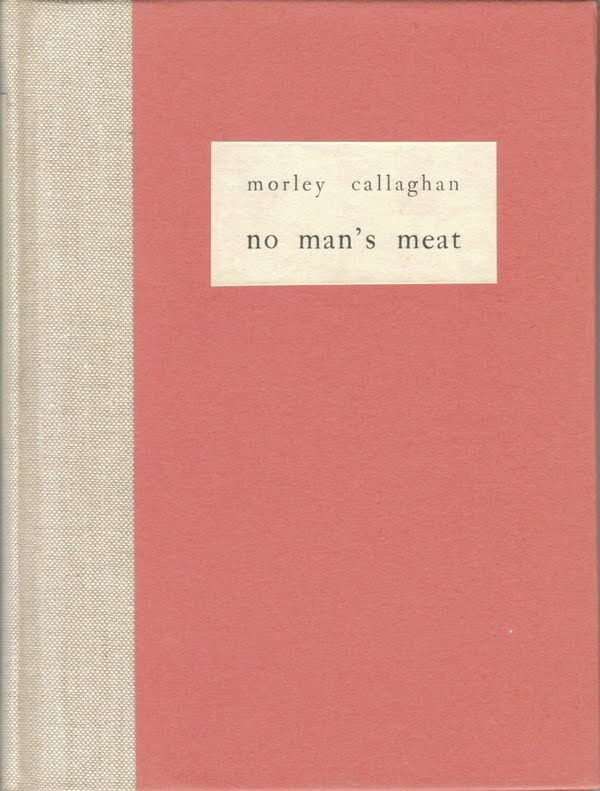 "EXTREMELY RARE Number in the Canadian Collins WHITE CIRCLE Series; VERY RARE Title by this Author," he says. I agree, adding: EXTREMELY FRAGILE. By all means, purchase the first (while you can), but give a thought to Véhicule's C$12, acid-free edition. Besides, it has that Foreword. 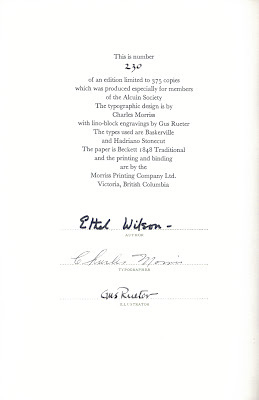 "This is an edition of 250 signed and numbered copies, of which the first 25 copies have been presented to the author." 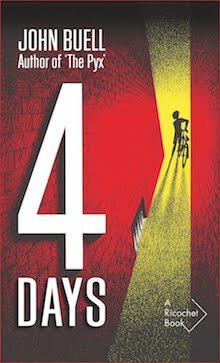 The rise of As for Me and My House from forgotten to canonical is as curious as it is controversial. 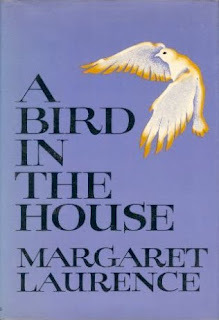 First published in 1941 by New York's Reynal & Hitchcock, the novel was all but ignored by critics and book-buyers, yet there it was sixteen years later as title #4 in the fledgling New Canadian Library. 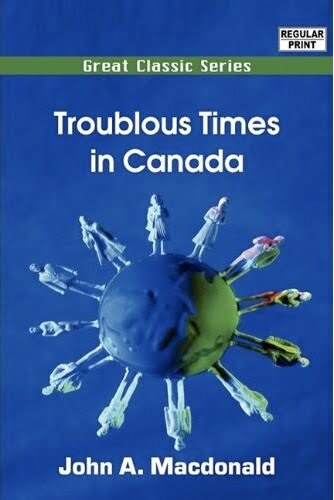 The novel has been a part of the series ever since; "a landmark work... essential reading for anyone who seeks to understand the scope and power of the Canadian novel," says current cover copy. I won't disagree, but do wonder as to its place. How is it possible that sixteen years after publication, fourteen years after the author's death, Fifth House has yet to run through the 225 copies for sale? Evidence of a disconnect between the academic's canon and the public's classic, or just another sad reflection of the deflated market for things CanLit? A bit of both, I think. 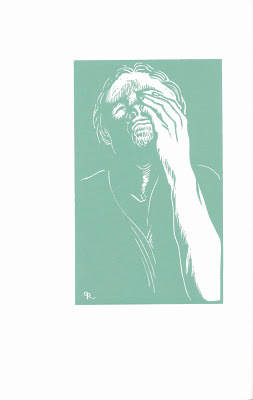 Ross was eighty-six and suffering from Parkinson's when he signed the sheets used in this limited edition. Copies can be purchased directly from the publisher. 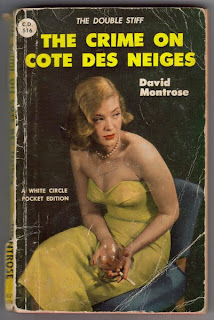 Addendum: In her Twayne study of Ross, Lorraine McMullen tells us that just a few copies of the 1941 Reynal & Hitchcock edition were imported into Canada. One ended up in Bayfield Public Library, was discarded and, finally, rescued from a leaky, mice-infested barn by yours truly. The "Date Due" slip indicates that it was only once ever checked out of the library. Something for Saturday. 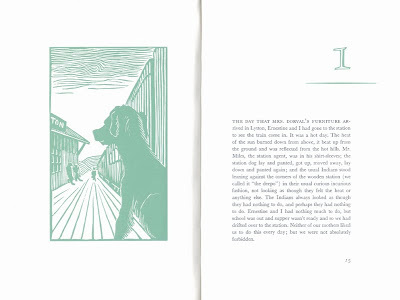 Over at Fly-by-night, dedicated researcher Bowdler uncovers two illustrations by the late director Leo Orenstein, author of The Queers of New York. Good fun! "This book was printed in an edition of 1,500 copies on Byronic Text India paper. There is a special series of 26 hardbound copies printed on Byronic Text Grey paper, signed and lettered from A to Z by the translator." Booksellers invariably mention the low print run of this, the finest English language translation of Sacher-Masoch's masterpiece. And why not? A full thirty-three years have passed and still it has never been reprinted. 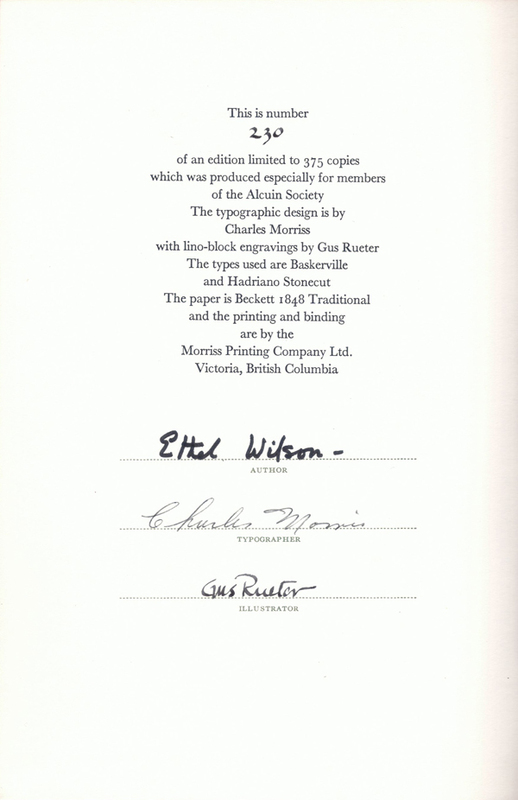 Blackfish co-publisher Brian Brett once told me that the he wasn't so sure that all 26 copies of the signed and lettered edition were ever produced. Seems they were pretty much made to order... no order, no book. This copy, which once belonged to Glassco, was bought for C$150 twenty years ago. The dab of liquid paper remains something of a mystery, though I do have my theories (most involving drink). 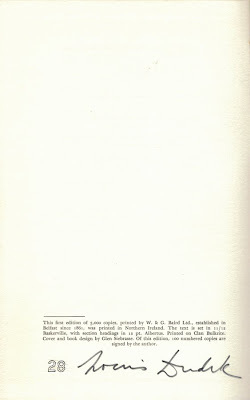 The remaining 1474 or so copies were published in both paper and hardcover. As might be expected, the former is less dear – Very Good copies go for US$30 to US$60 (ignore the copy currently listed online at C$125). The hardcover is more uncommon – expect to pay nothing less than US$150 (a bargain). I've not seen another copy of the signed and lettered edition offered for sale. Caveat emptor: A European collector emails asking my opinion on the inscribed paper copy of Venus in Furs that is currently listed on Abebooks at US$325. A fair price? Well, let's just say that amongst the thousands of handwritten documents studied in my eight years researching Glassco I never once saw anything that even remotely resembles the handwriting and signature found in this copy. 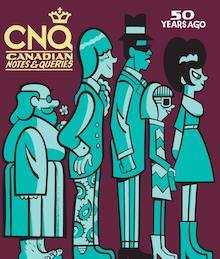 Three years ago, during our last months in Vancouver, I was working on an anthology of historic Canadian speeches. Among the thirty-seven, I included an address delivered by Arthur Meighen in 1921 at Vimy Ridge. He wasn't much as a prime minister, but Meighen was a skilled orator... and his words were his own. 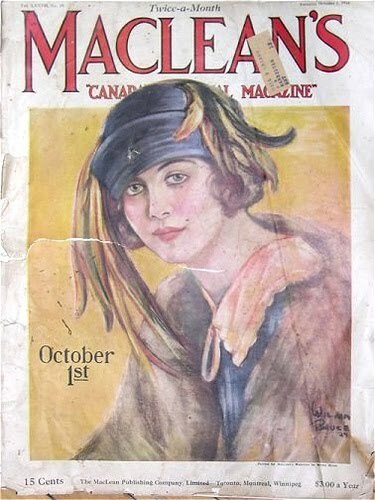 In the Introduction I wrote that as a boy Meighen had been a member of the St Marys Collegiate Institute Debating Society. The name meant nothing to me; I didn't even know where St Marys was. Four months later, we stumbled upon the town while house hunting in southern Ontario, and ended up buying a place right next to the old Collegiate Institute. 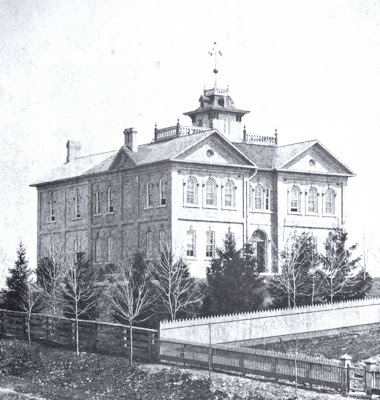 Since it opened 136 years ago, the building – now Arthur Meighen Public School – has lost its grandeur. Pretty much everything that made it beautiful has been stripped away or hidden behind bland extensions. Still, it was a smalltown school that produced a prime minister. There's something inspirational in that. Friday saw the final classes at Arthur Meighen Public School. The building is too old, they say. Those studying in seventeenth-century buildings at Université de Laval will not understand. Never mind, the developers have spoken. Its replacement sits on farmland adjacent the town's new Meadowridge subdivision. Out there are also the subdivisions named, by God, after what the contractors had to eradicate to build them – Birch Hills (named after the grove bulldozed away preparatory to laying the foundation), Vineyard Acres after the rows of Concord grapes plowed under to make way for them. Despite a good effort by some dedicated, intelligent souls, the honour bestowed on Meighen will not be transferred. The new school, which opens today, is named Little Falls. We're told that was the town's original name. It wasn't, of course. So much for education; so much for history. Thanks to my old pal Chris for hunting down the DeVries quote. Discovered in the school dumpster. 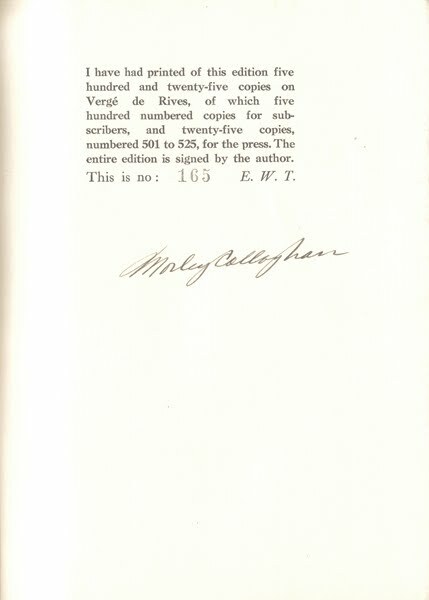 "Prescribed for supplementary reading in British Columbia"
"I have had printed of this edition five hundred and twenty-five copies on Verge de Rives, of which five hundred copies for subscribers and twenty-five copies, numbered 501 to 525, for the press. The entire edition is signed by the author. This is no: 165 E.W.T." I'm pretty sure that this is the first signed, numbered edition I ever bought. At the time I was writing for television – a daytime soap, if you must know – and felt pretty flush with cash. How flush? 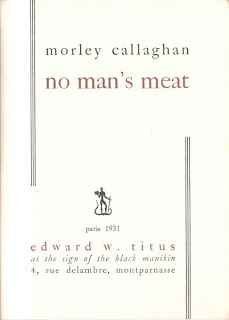 Well, I plunked down US$125 for this novella from Callaghan's summer in Paris. It's that old familiar story. A husband and wife entertain a female friend. 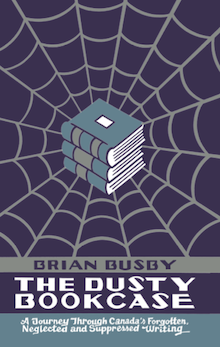 The guest ends up sleeping with the man to pay off a gambling debt. Everybody is unhappy... until the wife realizes that she's in love with her gal pal and the two run off together. Saturday night, Sunday morning. 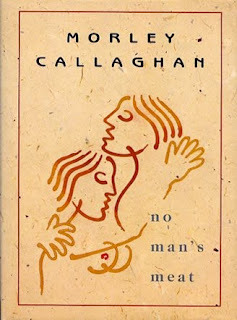 ...when No Man's Meat first appeared in 1931, its frank treatment of perverse sexuality [whoring? bisexuality?] 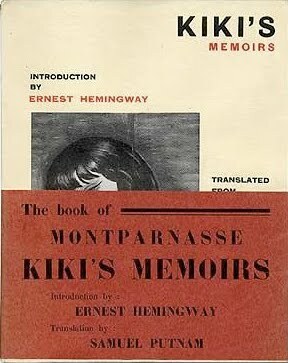 made it unsuitable for a commercial house, and it was privately published in Paris by an avant-garde press. Since then the limited edition of four hundred copies [525, actually] has gained widespread fame by word of mouth. Its early notoriety has been softened by Edmund Wilson's description of the piece as "a small masterpiece", and the original edition as become an underground classic, changing hands for two hundred dollars and more. 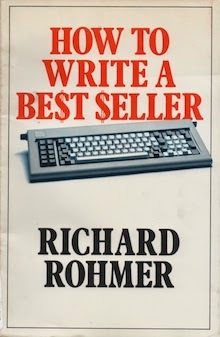 Thirty-two years later, there are plenty of copies listed online for US$60 (US$35 without slipcase). How to explain its decline. The internet has certainly played a part, but I think the real blame lies with Macmillan. 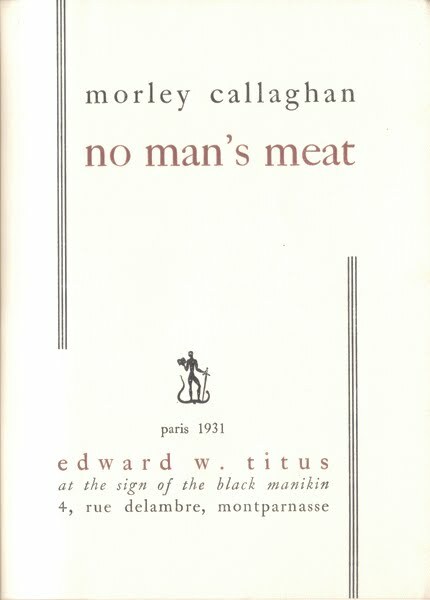 In making the novella more accessible, the new edition took away much of the mystery – No Man's Meat isn't nearly as risqué or quirky as the title suggests. 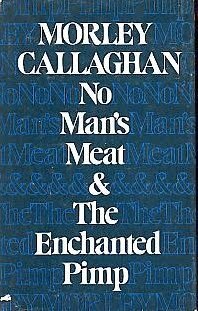 Stoddart re-resurrected the novella in 1990, but you'd never know it from their jacket copy, which implies that No Man's Meat is a new work. I believe it was the last book that Callaghan lived to see published. Note: That's Titus not Tutis. "This is number 230 of an edition limited to 375 copies which was produced especially for members of the Alcuin Society." 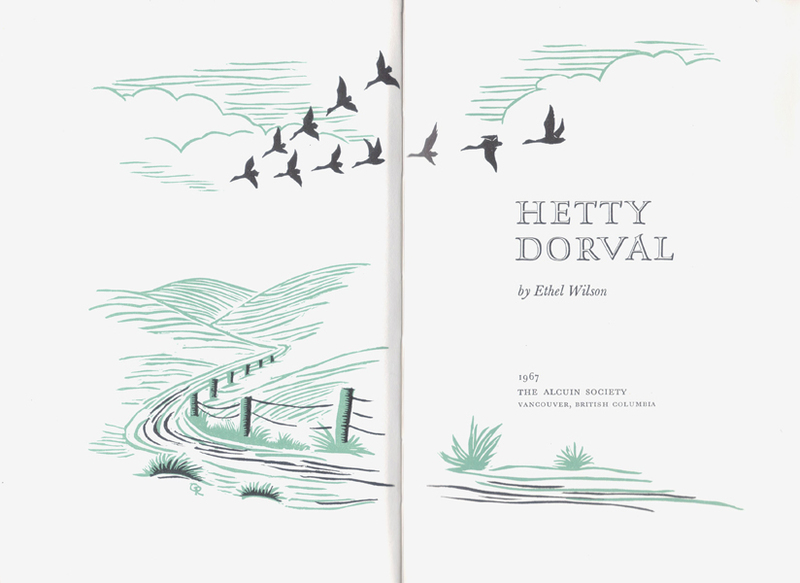 Anyone looking for evidence of the neglect shown Ethel Wilson, British Columbia's greatest novelist, might want to consider the prices being asked for this unusual edition. An elegant production, with a five-page author's introduction that appears nowhere else, it can be bought online for as little as US$25. Twenty years ago, during those heady days of bookseller catalogues, I paid C$75 for this copy. At the time, I thought it was a fantastic bargain. October looks to be a month of deadlines. There'll be fewer words and more pictures, beginning with Frank Newfeld's cover illustrations for The Journal of Saint-Denys-Garneau. I'm intrigued by this book. Hector de Saint-Denys-Garneau stands with Émile Nelligan as the country's great French language poet; his journal provides some disconcerting glimpses into the soul of a man who was plagued by inner turmoil and self-doubt. 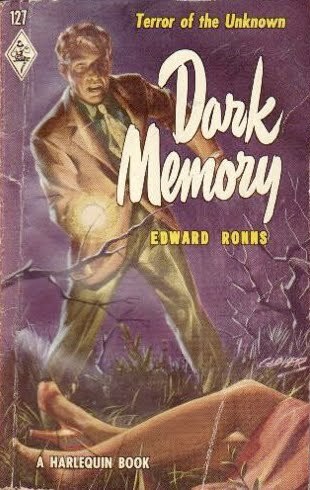 That said, I admit that much of my attraction has to do with the book's publishing history. 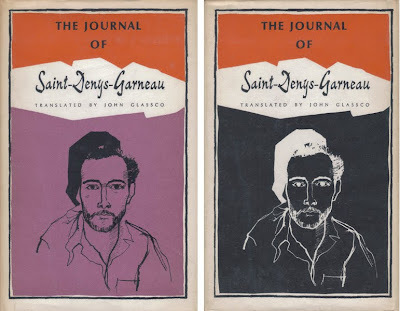 The Journal of Saint-Denys-Garneau appeared in 1962, yet there had never been an English language collection of his verse. 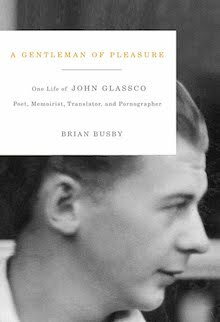 In fact, John Glassco, spent more than a decade trying to interest publishers. 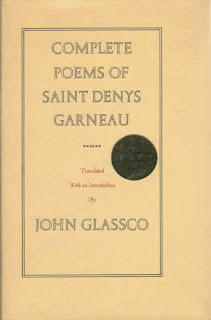 When finally published by Oberon in 1975, The Complete Poems of Saint-Denys-Garneau won the Canada Council Award for Translation. 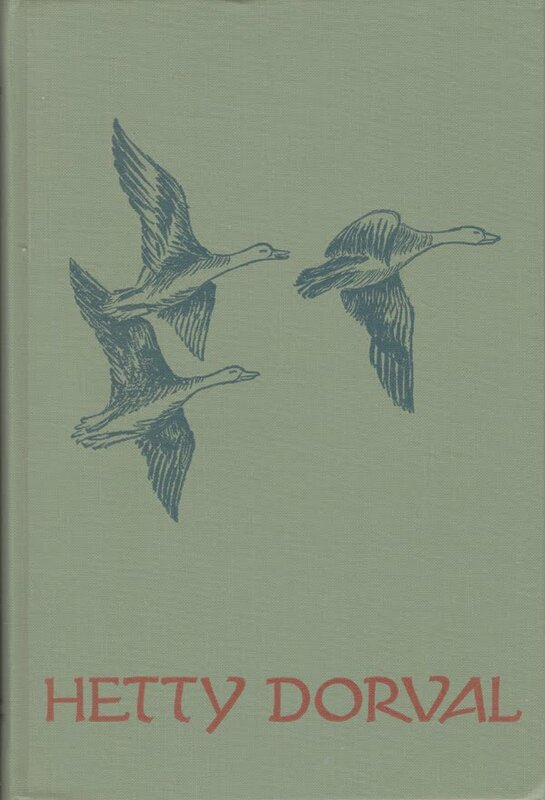 The Journal and The Complete Poems enjoyed just one printing each. Isn't it time they were reissued? An obvious bind-up, I think. 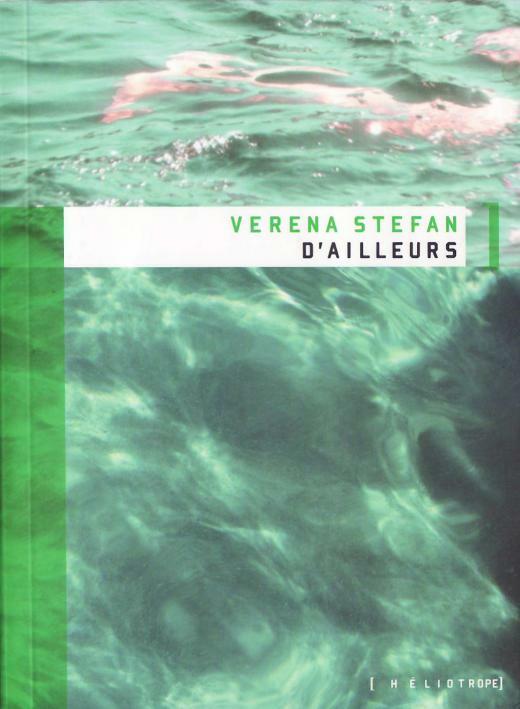 On a somewhat related note: Last week, the 28th John Glassco Translation Prize was awarded to Louis Bouchard and Marie-Elisabeth Morf for their work on Verena Stefan's Fremdschläfer, published as D’ailleurs by Editions Héliotrope. Now, there's news you won't see in today's revamped Globe & Mail. On another somewhat related note: Saint-Denys-Garneau has been on my mind since Jean-Louis Lessard's recent series on the man's work, and because I'm right now preparing my biography of Glassco for publication. Consider this the first plug.